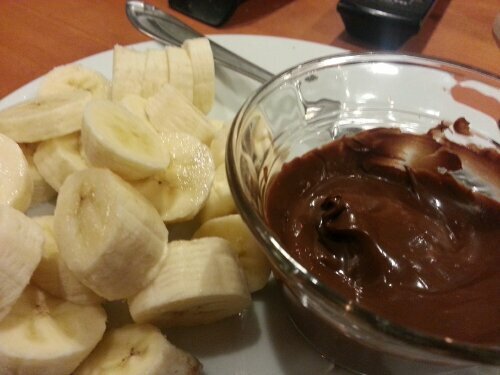 Sliced fresh banana and melted Ghirardelli semi sweet chocolate chips. Sundays. Noisy men on the couch, empty beer bottles, and whats that you say? Lasagna? Um…. yeah. My week of whole foods has left me feeling clean, but I found that the complete lack of comfort food has made me… well kind of depressed. I went to bed more than once this week, whimpering about wanting pizza or mac and cheese. Today, with the sounds of football tugging on my patience, I decided that enough was enough. I needed something to do, and I wanted some truly yummy comfort food. These crunchy babies are stuffed with Ground Lamb, Kalamata Olives, Feta Cheese and Parsley. The lamb was sauteed with onion and garlic, and the olives, feta and parsley were mixed up in the food processor until they were a uniform crumble. 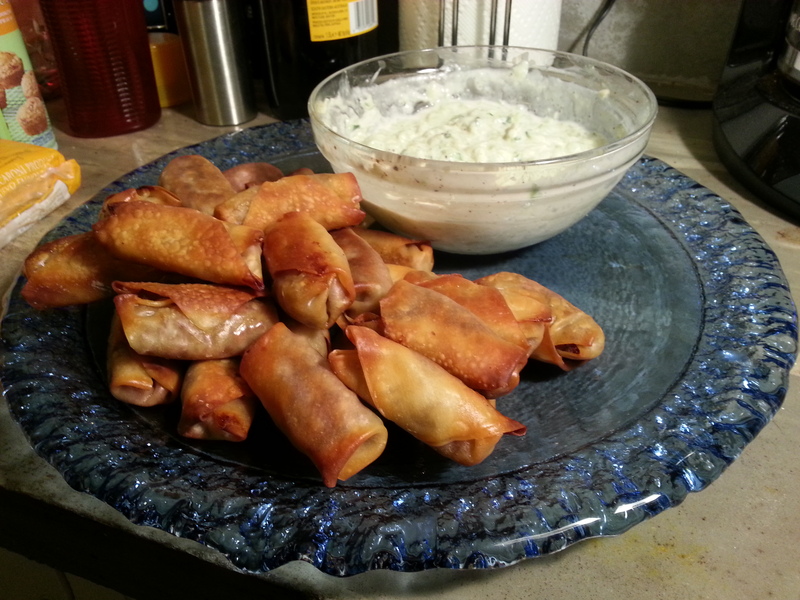 I put about a tablespoon of each filling in the wonton wrappers, wrapped them up like mini burritos, and stuck them in a 375 degree oven for 30 minutes, checking on the half way and turning them over so they could crisp up evenly. I also sprayed them down with canola oil before going in. It help get that nice brown color. This plate full used 1/2 lb of ground lamb, 1/2 onion, 2/3 cup of kalamata olives, 1 tbsp of chopped parsley and about 3 oz of feta cheese. Salt and pepper everything to taste. The Lasagna …. dun dun duuunnnnn! 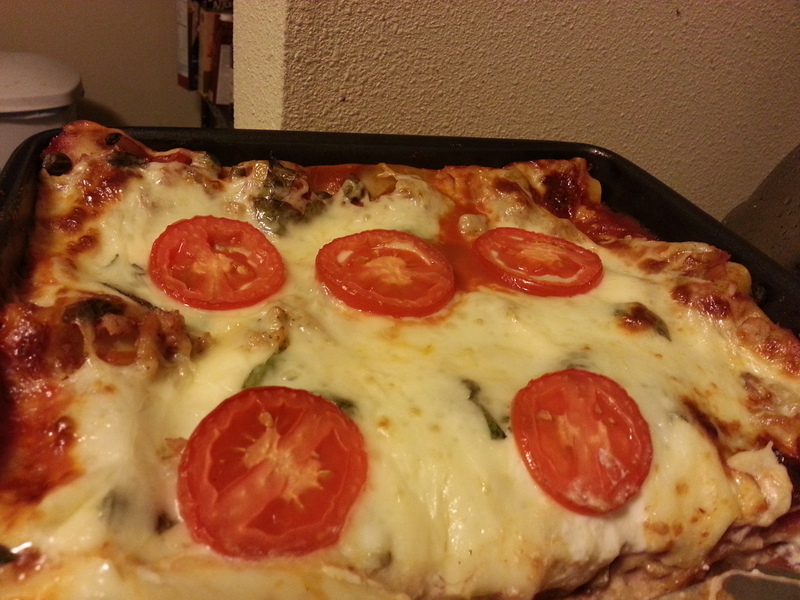 The layers were composed of balsamic roasted tomato sauce, ricotta, mozzarella, fresh basil and chicken Italian sausage. The tomatoes were from my garden. You need enough so that you have enough sauce. There really isn’t any exact quantity I can give you, since it depends on the kind of tomatoes you are using. I used a mix of sunburst cherries, heirloom black prince and romas. Toss them in olive oil and balsamic vinegar, salt and pepper them, and roast them at 400 for around 20 minutes. I also threw in 3 cloves of garlic and 1/2 an onion thinly sliced. After they finished roasting, I used a slotted spoon to scoop them into a small sauce pan, and added one can of tomato sauce and a splash more balsamic, and let everything meld together just a bit. The ricotta was mixed with 2 cloves of minced garlic, salt, pepper and the juice of 1/2 a lemon. The mozzarella was shredded… duh. I also used instant lasagna noodles, no boiling necessary. I covered it with foil and baked it at 320 degrees for 20 minutes, then took the foil off, and broiled it till the cheese was bubbly and starting to brown. YUM. Now its time to cool the apartment down from having the oven and stove on for hours. It was SWELTERING! I used my surprise day off to prep a boat load of fruit and veggies. It wasn’t really, but it certainly seemed like it was. I cut up a bunch of bananas, peaches and strawberries so I could freeze them for smoothies. I chopped up one head of Bok Choy (is that what you call it? A head? ), and 3 leeks, 2 lbs of collards from the garden. I made my veggie stock, and I roasted a bunch of sunburst tomatoes in balsamic and olive oil. I felt like I was cooking all day. Considering it was reaching 100 degrees outside, I was more than happy to remain in my hobbit hole of a basement apartment yesterday. Dinner last night was White Miso Soup with Bok Choy, Shitake Mushrooms, and a little bit of boneless skinless chicken breast (for my husband, who wont eat a meal unless there is meat in it). This was pretty easy. I bought a tub of white miso paste. I took about 2 tbsps of past and mixed it into 2 cups of my homemade veggie stock. I turned the heat on medium, brought it up to a simmer, then turned it down to low and added the veggies. I let the bok choy wilt a little before adding the thinly sliced chicken bits. It took less than 15 minutes. My side dish too much longer. Brown rice takes about 45 minutes to cook. 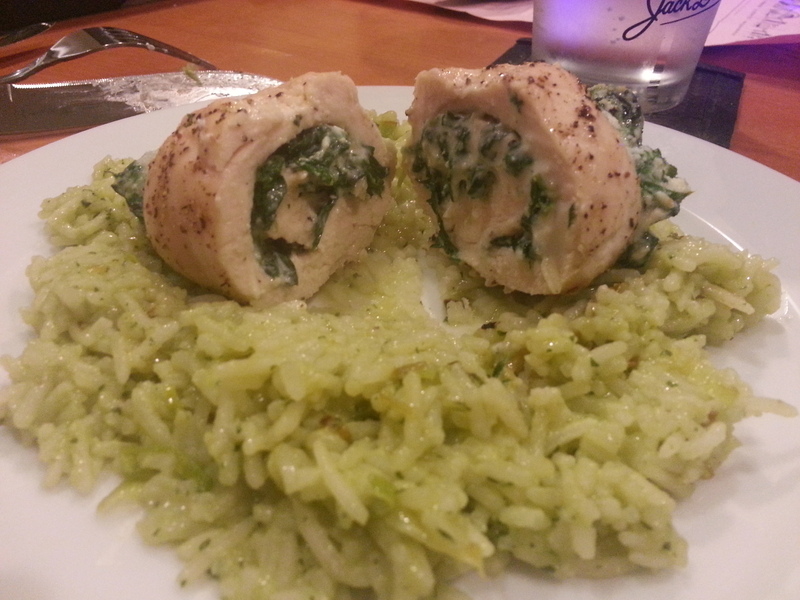 Its the same as regular rice in every other aspect. Equal parts liquid to rice. I used my veggie stock. Bring mixture to a boil, turn it down to low and put a lid on it. Then leave it alone for 45 minutes. 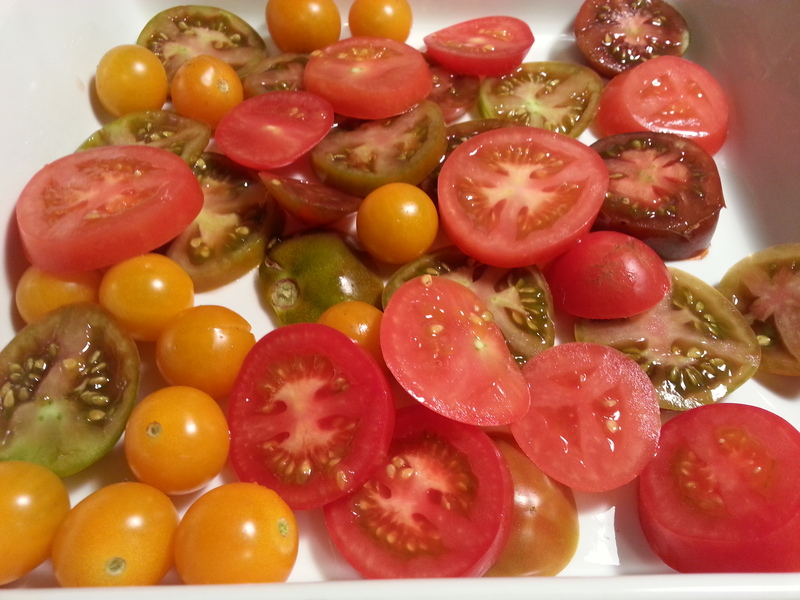 The Tomatoes were placed in a glass baking dish, tossed in balsamic vinegar, a bit of olive oil, and some salt and pepper, and was tossed into a 400 degree oven for about 35 minutes. 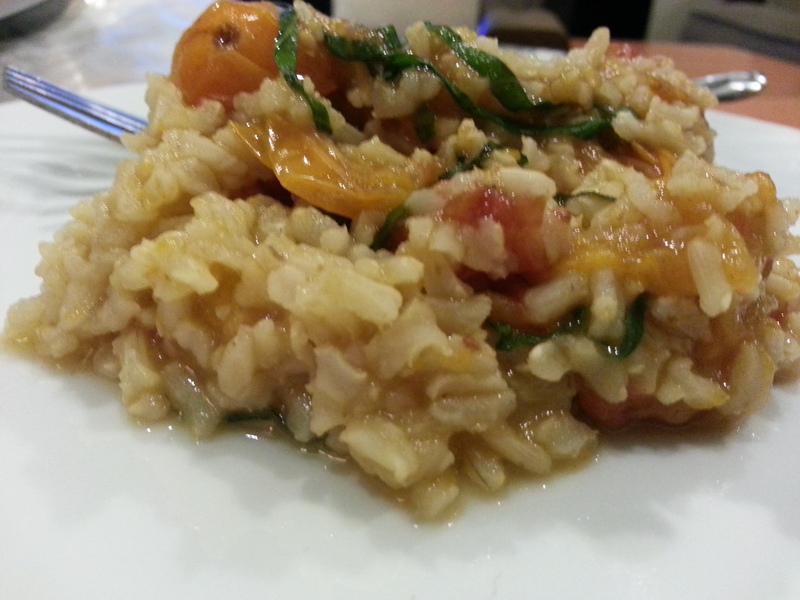 The tomatoes were juicy and created a sauce of their own when tossed with the rice and fresh basil. Tah-dah! 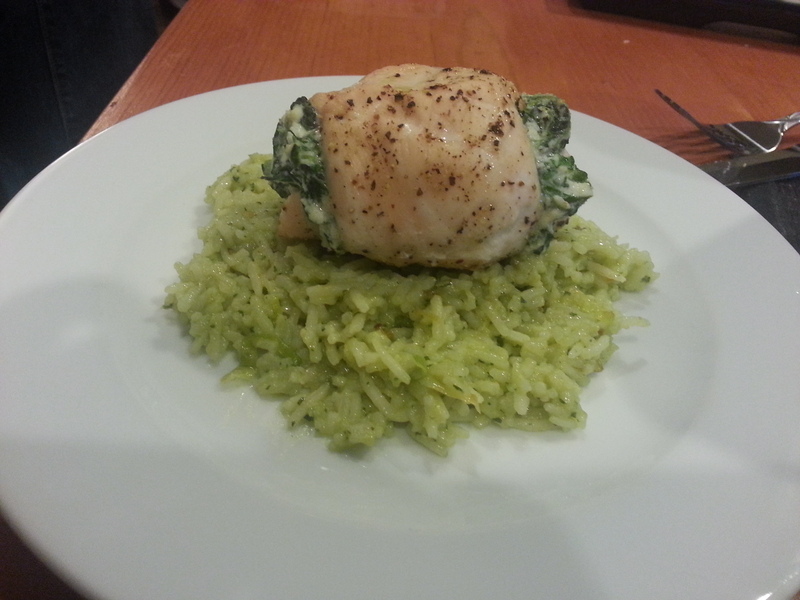 Fresh foods, whole foods, yummy dinner. My meal plan for tomorrow? Over easy egg on an extra thin yellow corn tortilla with a sprinkling of Trade Joes Mexican Lite shredded cheese mix. Green Fruit Smoothie – strawberries, peaches, banana, cucumber, grapes, and a bit of collard greens. WOOHOO! I still want pizza….. hopefully that goes away. While writing my grocery list for today, I decided to go through my refrigerator and take inventory, and hopefully find what was producing that rather off-putting smell. After I obsessively cleaned every drawer and shelf, I realized I have a whole lot of produce that is on its way out. I have been really upset with myself for the quantity of food and left overs that have found themselves in the garbage can lately. I needed to do something with all of these vegetables, and I knew that if I just steamed them or made a sauce, it wouldn’t get used before they went bad. I noticed that stocks were on my grocery list and then the light bulb hit. Duh. 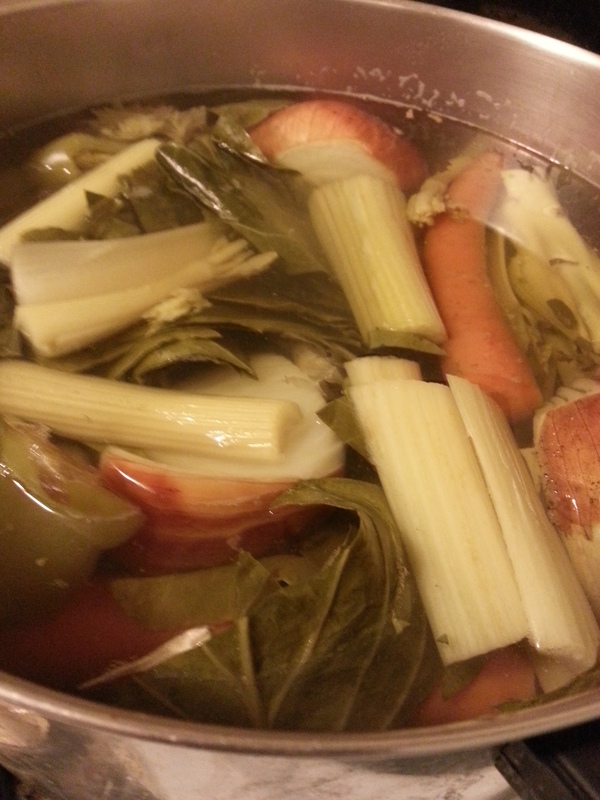 I’ll made a big pot of vegetable stock! After my day and a half of juicing, I still am not ready to add much animal product back into my diet, and I was going to need a lot of vegetable stock for the brown rice and quinoa dishes that I have planned for the rest of the week. As the pot simmers slowly on the stove, and the smells are perfuming the air, and I’m becoming more and more thankful for my surprise day off today. Remember, dont boil the veggies. You want a low simmer, or you kill all the nutrients in the vegetables! And I had a rye krisp cracker with some sliced turkey and hummus on it, and surprising no one, I FEEL SO MUCH BETTER. So that’s it. 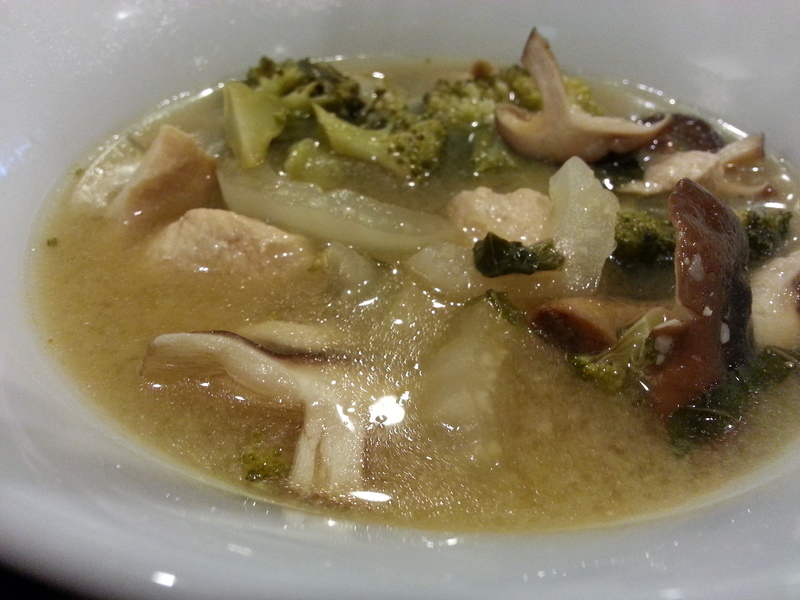 Im 1.5 days cleansed and looking forward to my vegetable soup for dinner. Who’s dumb idea was that anyway. Just in time for Wednesday dinner! Persistent pounding headache and undying craving for Lasagna. I think I will need to make some for dinner on Saturday.